This is a great quilt for a boy or a girl. The colors in this one are blue and brown for a boy but they can be any color or fabric you would like. You can have it match the child's room in themes such as cars, trucks, animals, butterfies or fairy princesses. The list is endless. 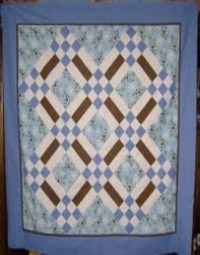 This Quilt comes in two sizes 50" x 50" and 57" x 74". 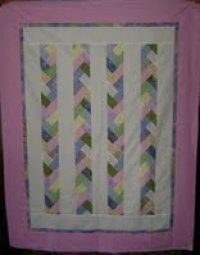 This quilt pattern is a Mini Braid and it's perfect for that special little girl. Can be made in any color combination you would like. 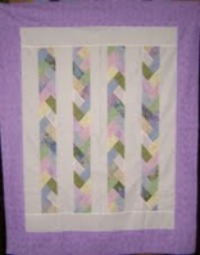 This particular quilt was crafted in purple, with a combination of fabrics in various colors in the middle. Quilted in Butterfly stitching. Quilt Size 46" x 52" . This is a larger Mini Braid made with a combination of fabrics and colors. In this quilt I made the dominate color pink. As with the other braid, you can pick whatever color combination you want for this quilt. Quilt Size 47" x 61". If your special little girl or boy has a favorite theme, I will be happy to work with you to make a quilt that will represent the object of their affection.